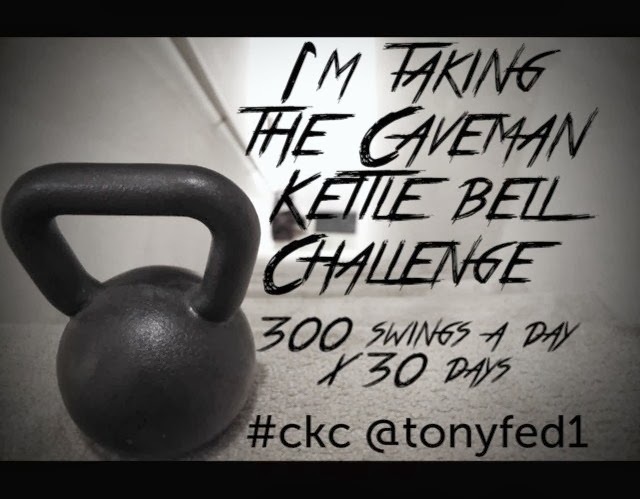 If you took part in the "30 Day Caveman Kettlebell Challenge" you not only have sore hands, a kettlebooty, and a new found appreciation for counting (1,2,3...300! ), you have the chance to win a sweet prize pack valued at over $100 bucks! A pre-order of my upcoming cookbook "‪‎PaleoGrilling‬ - A Modern Caveman's Guide to Cooking with Fire"
I will be accepting entries until Friday 4/4/14 at midnight (EST time) and you can even get multiple entries if you get creative (details on the contest FB post). I recently came across a guest coach post on BreakingMuscle.com titled "300 Swings a Day for Faster Fat Loss" by Pat Flynn of The Chronicles of Strength. "Maybe it's just crazy enough to work!" Needless to say, I would "like a simple way to cut fat." And, given that I'm fairly proficient at kettlebell swings and currently have one sitting in my living room, I really have no excuse. I thought it might be nice to have some some company however, misery loves that doesn't it? Along the way, tag my Instagram profile @tonyfed1 or hit me up on Twitter @tonyfedfitness to keep me updated. Use hashtag "#ckc" in any social media posts so we can all see what everyone is doing. Currently, it's all cute dog pictures (I have no idea why) so it will be pretty funny to blow up the hashtag feed with kettlebell beasts. When this is all said and done, I'll throw down some prizes for those who finish (which will include a pre-order copy of my upcoming book "Paleo Griling" as well as some as yet to be unveiled rewards.) This will be handled via my Facebook page. That should just about cover it, good luck and get swinging! 30lb for a woman...? I hope she's already in pretty decent shape, beginner weight is more like 10-20lbs, if I did 30 I wouldn't be able to walk the next day. Geeky Staci, thank's for pointing that out. I assumed that anyone who would be willing to try this is already pretty good at KB swings, but I shouldn't take that fact for granted. I updated the post to give novices and beginners a better idea of what weight they should be using and how to use proper technique. At first, I was like 300 kb swings! What?! Then I saw the weight was 30 lbs and was like ... oh, that's not bad. So yeah, I guess it depends on where you're at with your kb work! FYI: CKC is the Canadian Kennel Club hence the pictures of cute puppies. If you are going to a box would this be on your days off only? or in addition? Evan, I've continued my normal workout regiment and just slide 100 swings in before I leave the house, around lunch time, and before dinner. It hasn't really seemed to impact my recovery (6 days in so far) and I think the main effect is that it provides an intermittent metabolic bump that upregulates glucose metabolism and fat oxidizing hormones. Hey Tony. Been doing this for 13 days now. 300 Russian swings a day with a 32 kg kb. I do sets of 15 on a good day, all through the workout. Other days I break them up into 10-15-20. It varies. I find it is nice to make the hard work a bit (fun), or rather versatile, as it keeps up the motivation. I have no back pain as I´m very focused on using good technique. I am 44 years old, a bit overweight (I like food and beer). I´m curious as to what You meant about doing a 100 swings. Do You feel it´s better to go through a 100 swings unbroken (with a lighter weight), than to do sets of 10-15-20 or whatever? Something has definately changed around the stomach, should have taken a photo the very first days I started. Anon, I think there is definitely a metabolic benefit to maxing out (with good form) the number of reps you can continuously perform. However, I wouldn't let this recommendation deter you from breaking things up however you see fit. Not too late for that "before" pic btw! Do we need to post a before/after or just an after with our kettlebell? Thanks! Do you need to do some kind of warmup before swinging the bells, if so what do you do. If you don't aren't you at risk for injuries? Not sure if you are still following this since it was almost a year ago. Terri, I still do KB swings regularly, but haven't continued with 300 per day! By the time I finished however, I could do ~500 unbroken swings with a 45lb kettlebell. The biggest thing I found for super high rep KB work is that my wrists started to hurt when I did the swing two handed. Doing 1 arm swings (alternating between left and right hands every 25 reps) seemed to be the best system. To answer your question specifically, no, I didn't do any particular warm up and didn't experience any problems. I would encourage you to have someone (ideally a qualified coach) to assess your technique before you dive into something like this as bad form WILL get you into trouble.